Find the perfect mate to your Kasasa Cash® or Kasasa Cash Back® checking account! Turn your Kasasa® checking rewards into dividend-earning savings automatically every month. If for some reason you don’t meet these qualifications, don’t worry. You can still earn our base rate on Kasasa Saver and get right back to earning full rewards the very next cycle that you qualify. *Checking account eligibility is subject to age and ChexSystem verification. View our Service Pricing. Kasasa Saver. daily balances up to and including $25,000.00 in your Kasasa Saver account earn an APY of 0.50% and daily balances over $25,00.00 earn a dividend rate of 0.2500000000% on the portion of the daily balance over $25,000.00 , resulting in a range from 0.50% to 0.30% APY depending on the account's daily balance. When your Kasasa Cash Back account qualifications are not met during a Monthly Qualification Cycle: Kasasa Saver: the entire daily balance in the Kasasa Saver account earns a dividend rate of 0.0499885453% resulting in an annual percentage yield of 0.05%. Qualification Information: To earn your rewards, the following enrollments must be in place and all transactions and activities must post and settle to your Kasasa Cash Back account during each Monthly Qualification Cycle: At least 12 debit card purchases Be enrolled in and log into online banking one time per month Be enrolled in and have agreed to receive e-statements rather than paper statements Maintain a valid email address on record with credit union Account transactions and activities may take one or more days to post and settle to the account and all must do so during the Monthly Qualification Cycle in order to qualify for the account's rewards. The following activities do not count toward earning account rewards: ATM-processed transactions, transfers between accounts, debit card purchases processed by merchants and received by our credit union as ATM transactions, non-retail payment transactions and purchases made with debit cards not issued by our credit union. Transactions bundled together by merchants and received by our institution as a single transaction count as a single transaction for the purpose of earning account rewards. "Monthly Qualification Cycle" means a period beginning one (1) day prior to the first banking day of the current statement cycle through one (1) day prior to the last banking day of the current statement cycle. "Banking Day· means any business day on which an office of the credit union is open to the public for the purpose of carrying out substantially all of its banking functions. "Business Day" means a calendar day other than a Saturday or a Sunday, January 1, the third Monday in January, the third Monday in February, the last Monday in May, July 4, the first Monday in September, the second Monday in October, November 11, the fourth Thursday in November, or December 25. If January 1, July 4, November 11, or December 25 falls on a Sunday, the nex1 Monday is not a Business Day. "Statement Cycle" means the period of time for which our credit union provides a summary of the financial activities and transactions that post and settle to the accountholder's account. Reward Information: When Kasasa Cash Back qualifications are met during a Monthly Qualification Cycle, you will receive $6.00 cash back on up to a total of $200.00 debit card purchases that post and settle to the account during that cycle period. A maximum of $6.00 cash back payments may be earned per Monthly Qualification Cycle. In addition, daily balances up to and including $25,000.00 in your Kasasa Saver account earn a dividend rate of 0.4988578137% resulting in an APY of 0.50; and daily balances over $25,000.00 earn a dividend rate of 0.2500000000% on the portion of the daily balance over $25,000.00, resulting in a range from 0.50% to 0.30% APY depending on the Kasasa Saver account's daily balance. You will receive reimbursements up to $25.00 for nationwide ATM withdrawal fees incurred within your Kasasa Cash Back account during the Monthly Qualification Cycle in which you qualified. When your Kasasa Cash Back account qualifications are not met, no cash back payments are made and ATM withdrawal fees are not refunded. In addition, the entire daily balance in the Kasasa Saver account earns a dividend rate of 0.0499885453% resulting in an annual percentage yield of 0.05% APY. Dividends will be credited to your Kasasa Saver account on the last day of the current statement cycle. The cash back payments and nationwide ATM withdrawal fee reimbursements earned in your Kasasa Cash Back account will be credited to your Kasasa Saver account on the last day of the current statement cycle. APY = Annual Percentage Yield. APY calculations are based on an assumed balance of $10,000 + $100,000 in your Kasasa Saver account and an assumed statement cycle of thirty-one (31) days. Rates, rewards, and bonuses, if any, are variable and may change after account is opened without notice to you. No minimum balance is required to earn or receive the account's rewards. Rewards less than a penny cannot be distributed. Fees may reduce earnings. You will automatically qualify for the account's rewards during your account's first statement cycle. If the account is closed before rewards are credited, you will forfeit the rewards. Additional Information: Account approval, conditions, qualifications, limits, limeframes, enrollments, log-ons and other requirements apply. $25.00 minimum deposit is required to open the account. Monthly enrollment in online banking, or mobile banking, eStatement is a condition(s)] of this account(s). 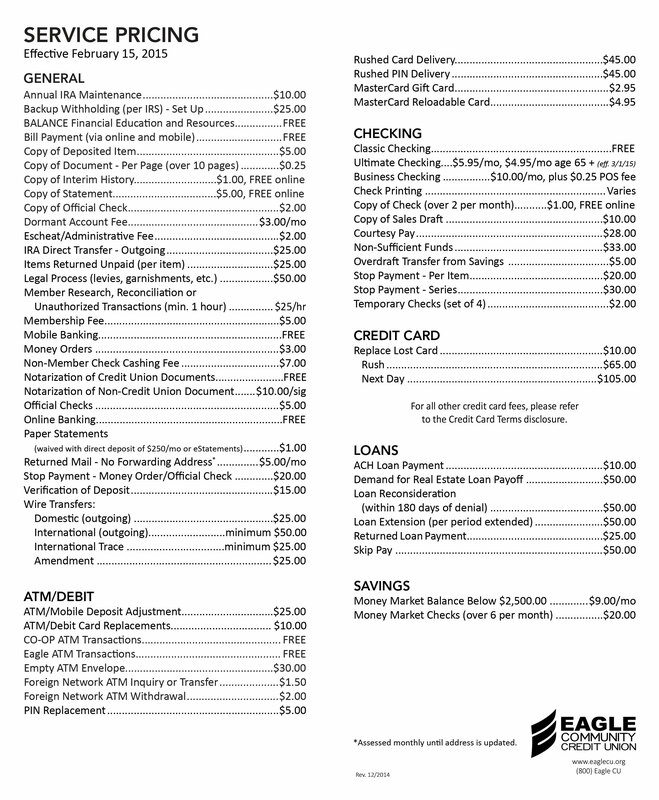 See accompanying Fee Schedule for fees that may apply to this account. Enrollment in electronic seivices (e.g. online banking, e-statements) and log-ons may be required to meet some of the account's qualifications. Limit of 1 account(s) per Member. There are no recurring monthly maintenance charges or fees to open or close this account. This account is not to be used for commercial purposes. If the account is closed, you will forfeit any rewards that have not been credited to your account. A Kasasa Cash Back account is required to have a Kasasa Saver account. If, for whatever reason the Kasasa Saver portion of your account is closed, your account will automatically be converted to the associated standalone Kasasa Cash Back account and that account's terms and conditions articulated within their specific disclosure will apply. A linked Kasasa Saver account is required for automatic savings. Account Limitations: If Kasasa Saver Is Established As A Savings Account: Transfers or withdrawals from a Kasasa Saver account to (a) another account of the same depositor at our institution or to (b) a third party or an account of the same depositor at another bank, & made by preauthorized transfer, automatic transfer, telephone, fax or internet banking seivice and (c) transfers or withdrawals to a third party or to an account of the depositor to another account at another bank made by check, draft, debit card are limited to an aggregate total of six (6) per calendar month. There is no limit to the number of transfers or withdrawals from your Kasasa Saver account to repay loans at our institution or are made in person, by mail, by messenger or at an ATM. These transactions are considered made on the date the transaction posts and settles to your account, not the date the withdrawal request was initiated. Contact one of our credit union service representatives for additional information, details, restrictions, reward calculations, processing limitations, cycle dates and enrollment instructions. Federally insured by NCUA. Your Savings Insured To $250,000 Per Account. Kasasa, Kasasa Cash Back and Kasasa Saver are trademarks of Kasasa, Ltd., registered in the U.S.A.